It's up 30% in the last year, and here's why the stock could continue to climb. There's nothing glamorous about day-to-day operations at U.S. Ecology (NASDAQ:ECOL), which provides environmental services to government and commercial entities across North America. Boring? Perhaps. Valuable? Absolutely. Investors have watched this boring market niche company handily beat the total returns of the S&P 500 in the past five years. What exactly are environmental services? U.S. Ecology owns and operates facilities that properly treat and dispose of hazardous waste materials ranging from laboratory chemicals to industrial wastewater, aircraft deicing fluid to mercury. And since there won't be any shortage in the supply of hazardous waste materials for the foreseeable future, investors can bet that a well-run company that executes its strategy can find opportunities to exploit for the long-term. After making aggressive moves for growth in 2014, the company certainly fits the bill. The single biggest reason to be optimistic about U.S. Ecology stock is the 2014 acquisition of The Environmental Quality Company, or EQ. From a financial perspective, combining the businesses will lead to an immediate more than doubling of revenue and sizable earnings growth in the first full year of operations. Investors can thank a 500% increase in customers, the addition of 19 new treatment and recycling facilities (compared to just six before), and 21 services facilities (serve as bases for field work). While there were only two full quarters of combined operations in 2014, investors had little to complain about. Consider how the three entities -- U.S. Ecology's legacy business, EQ assets since the acquisition, and the combined business -- performed in 2014. 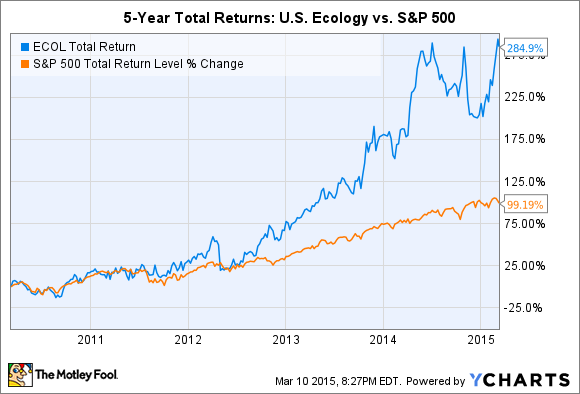 U.S. Ecology will perform even better in 2015; the first full year of combined operations. Consider management's financial guidance for the year ahead. Note: Adjusted EPS is presented. Source: U.S. Ecology presentation. In other words, investors can expect big growth in 2015 compared with 2014, especially when compared only with legacy operations. But don't forget: U.S. Ecology has plans for growth that extend beyond far this year. In addition to the immediate effects of the EQ acquisition, there are several intriguing long-term opportunities investors should consider. For instance U.S. Ecology is able to offer a broader array of services that it couldn't before, including emergency response, incineration, and packaging and collection. The acquisition also allowed the company to gain a strategic foothold east of the Mississippi -- a big advantage considering that its legacy business is biased toward the West Coast of the United States. Image source: U.S. Ecology presentation. Perhaps the most important takeaway for investors is the opportunity for EQ assets (heavily based on recurring, low-margin services) to eventually feed business to high-margin treatment and disposal assets. That could allow U.S. Ecology to compete for larger and more valuable contracts that require more vertically integrated operations. Even in the face of falling crude oil prices, the United States continues to increase production of raw petroleum (and refined petroleum products) to near historic levels. That's proving to be a boon for U.S. Ecology, which lists Hess Corp., Royal Dutch Shell, Kinder Morgan, and other refiners and crude oil handlers as customers. Where does U.S. Ecology come into play? Consider that although oil refineries must perform specialized tank cleaning and maintenance on a routine basis, it may only be necessary once or twice per year. Rather than hire and train employees, purchase expensive and specialized equipment, and jump through regulatory hoops covering treatment and disposal, many oil refineries find it easier and cheaper to outsource the work to experts. In this case, companies such as U.S. Ecology. And, yes, once again, the EQ acquisition comes into play. The leading industrial and field services network acquired by U.S. Ecology is heavily based in industrial centers on the East Coast, including the petrochemical hub in northern New Jersey. That will provide years of steady and recurring revenue streams for investors. It's a great time to be a shareholder of U.S. Ecology stock, especially if you have a long-term mind-set. Sure, the EQ acquisition added less-profitable revenue to the mix, but field services have the potential to translate into more high-margin treatment and disposal business in the long-term. That may require a leap of faith for investors today, although it's important to remember that the company is profitable with or without that strategy playing out.